14.12 The first pcture of the U-litter, 2 weeks. 07.11. Ch Kazar Rurik went Best of Breed and Best of Group at Orkanger Saturday 7th under judge Adriana Griffa, Italy. 18.09 J.Ch Kazar Sveta won her first adult CAC under judge G.Jipping, Holland. Sveta is owned and loved by Martin Brügger. 17.09. Congratulations to Kazar Tara and her owner Mariann Schmitter in Switzerland on Taras Junior Championship! Tara won her 4th JCAC in Lausanne on the 17th of Oct. under judge Gabriela Ridarcikova. 01.09. Ch Kazar Rurik had a great weekend at The Dog Festival in Støren! About 1100 dogs entered each day. Group judge: Robin Searle, England. Best in Show judge. Michael Forte, Ireland. 01.09. Kazar Tula entered her first official shows last weekend at the Dog Festival in Støren (N). She won the CAC and was BOS both days. Judges: Josefina Gomez Toldra, Spain and Robin Searle, England. Owner Jorunn Hodneland. 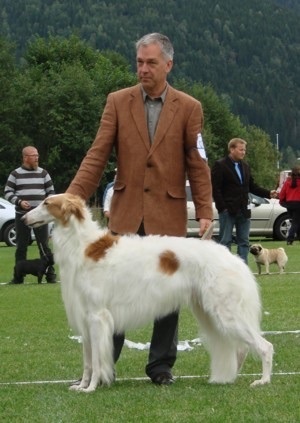 29.08: Kazar Tara won her second JCAC in Switzerland. She also won BOB-JUNIOR and BEST IN SHOW-3 JUNIOR. Judge: Magnus Hagstedt, Sweden. Taras owner is Marianne Schmitter. 04.08. Last weekend we went to Nesbyen and at the Sighthound Club all breed show on Saturday 1st of August, Rurik won BOB under judge Jacki Jackson, South Africa. 24.07. 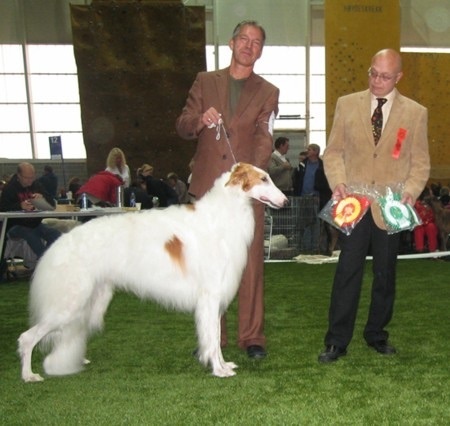 Ch Kazar Rurik won the CAC and became a Swedish Champion at the annual prestigeous sighthound show "Skokloster". Judge: Bitte Arens, Italy/Sweden. 27.06. 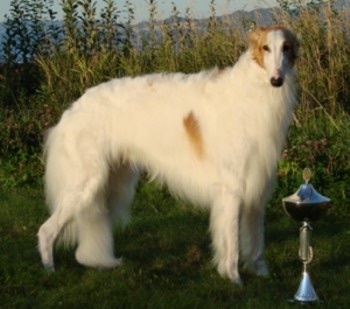 Int, Nordic Ch Kazar Olympia went BOB, BIS-3 and Best in Show Veteran at The Sighthound Specialty in Trondheim. Kazar Slava came in BB-2 with CAC. She also became Norwegian Champion! Ch Kazar Rurik was BOS and Tengis BM-2 with CAC! Judges: Birgit Wamberg (Denmark) and Karin Hedberg (Sweden). 28.06. Rurik won BOB, BOG and BEST IN SHOW-2 at the big Norwegian Kennel Club International Show in Stjørdal! Judges: Per Iversen (Norway), Paul Stanton (Sweden) and Jacki Jackson (South Africa). 22.06 Rurik have had yet another great show weekend! This time at two all breeds CAC show in Oppdal. On Saturday 20th he won the breed, group and placed third Best in Show. Sunday he headed for gold and went all the way to BEST IN SHOW !! 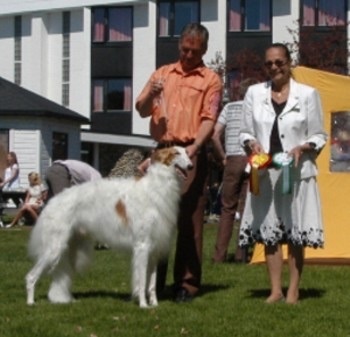 06.06 Ch Kazar Rurik went BEST IN SHOW at The Norwegian Borzoi Specialty in Drammen and repeated his great win from last year! One year old Tengis went Best Male 3! 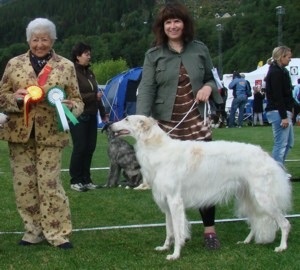 Tengis is owned by Susanne Strøm of Steppdance Borzoi and Whippets. 05.06. Rubine won Winners Female and got a 4 point major! 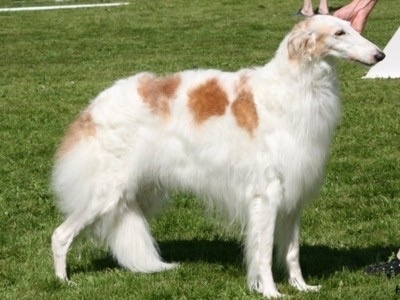 It took place at The Greater Twin Cities Borzoi Club Specialty Show in Minnesota. 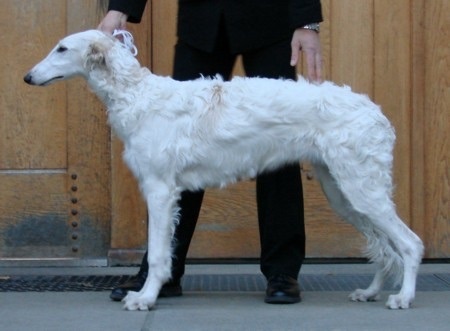 Judge was Kalen Dumke, Nonsuch Borzoi. 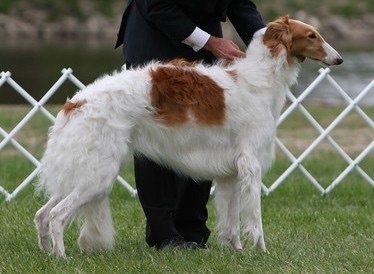 Rubines owner is Melanie Richards, Lythe Borzoi, Minnesota. 02.06. Last weekend Ch Kazar Rurik attended the big sighthound show at Hurdal near Oslo. On Saturday 29th he won BOB and Best in Show 3! Judges: Barbara Ruth Smith (breed) and Joan Goldstein (BiS), both USA. On Sunday Rurik was BOB and Best in Show 2! Judges: Joan Goldstein (breed) and Wilfriede Schwerm-Hahne (BiS), Germany. 26.02 On his first show this year Ch Kazar Rurik went Best in Show-4 at an all breed show in Sunndalsøra yesterday! 800 dogs entered. Judges were: Åke Sjøstrøm (S) and Arne Foss (N). 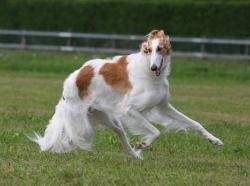 Borzoi on Saturday and 9 on Sunday. She picked up 6 GRC points and 5.25 National points in one weekend. Well done! 21.02. Kazar Rimskij takes his first major and Best of Opposite at the Boca Raton Dog Club Show in Florida, USA today! Congratulations Violet! 09.02. 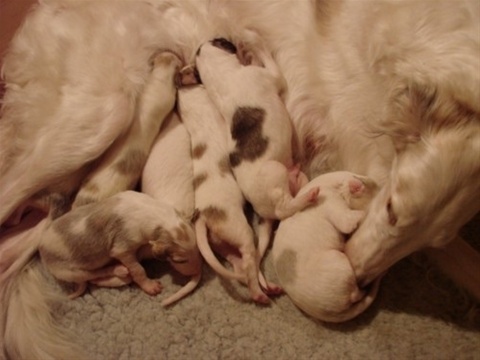 Rurik became SIGHTHOUND OF THE YEAR no 6 in 2008! 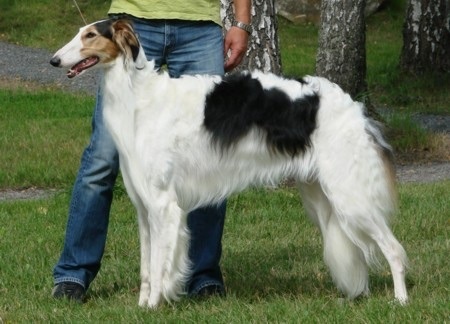 This also makes him the mostwinning borzoi last year (The Norwegian Sighthound Club system). 07.02. Saros went second in Hound Group at The Darlington & District Canine Society Open Show at Scorton, North Yorkshire yesterday. Judge: Hazel Arris, Sharazah Afghans. Congratulations Cliff and Ann (England)! Tula went Best in Group 2 at an all breed puppy show in Trondheim (N). Well done Jorunn! 06,12 Rimskij went Best of Winners and BOB at The Greater Miami Club today! Judge: Kent Delaney. Owner: Violet Tcherkin, Florida. 30.11. Puppy Shows: Tula went BOB and Group 2 in Trondheim. Judge: Marianne Holmli. Tavda won BOB and Group 3 in Andebu the same day under judge Eli M. Klepp. On the 8. of Nov. Tavda went BOB and Group 4 under Zeferino Silva in Kongsberg. 04.10. Rurik went Best of Breed with CACIB and Group 4 at the NKC International Show in Kongsvinger. Judge: Ray Lindholm, Sweden. Judge: Andre van der Broek. Congratulations Martin and André! 28.09. Kazar Tengis went BOB and Group 2nd and Tula went BOS at a puppy show in Klett today. Judge: Line Haugen. Owner: Susanne Strøm. 21.09. Kazar Tengis (4,5 mths) went BOB and Group First at an all breeds puppy show near Trondheim today. Judge: Arne Foss (N). 14.09. Kazar Rubine got her 4th point and BOB on Sunday 14th. from the Canadian judge Guy Jeavons. Congratulations Melanie! Kazar Tavda won BOB and Group-4 at her first puppy show the same day. Judge Anne C. Uelsrød, Norway. Owner: Eva Gro Røssok. 20-31.08 On Saturday Kazar Rurik received his 15th CAC and became a Norwegian Champion. 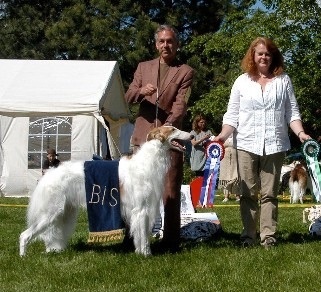 He also went BOB, Group 1 and Best in Show all breeds at the Dog Festival in Støren over 800 dogs! Judges was Anatoli Zhuk, Belarus and Salvatore Tripoli, Italy. Today, Sunday, the success continued. Kazar Slava won CAC and BOS from the junior class and Rurik, first time in champion class, won BOB and Best in Show at the Sighthound show of Mid Norway under judge Andres Korozs, Hungary. He also went Best in Show #3 at the Dog Festival's second day! Judge Dominic Harris, U.K.
24.08. Rubine won her 3rd point today (USA). Rodina was BOS at her first show as a champion in Mo (N). 23.08. Rodina won her final CAC and BIM today at Mo (N). Now she is a Norwegian Champion! Judge was Lokodi Zsolt, Romania. She was 2 years last Monday, so this was her first posibility to gain the title since this is the minimum age to become a champion in Scandinavia. Congratulations Kleo!